Green smoothies are the perfect way to get your vegetables and fruits in and improve your health and well-being. Drinking a nutritious green smoothie a few times a week really does wonders to your overall health. The fun with blending, and also juicing, is that you can try so many different recipes and ingredients. You may be surprised what types of ingredients I often add to my smoothies, such as turmeric, chia seeds and egg shells. There are so many different combinations of recipes to try out, that you’ll never have to stop experimenting. Drinking green smoothies is one of the best ways to get a great variety of nutrients in. A good blender is able to extract the nutrients from greens so you can get the most out of it. It’s also very easy and quick. Within 10 minutes you can prepare yourself a green smoothie with different types of vegetables and fruits. Green smoothies are also very energizing. If you’re feeling a bit sluggish, instead of grabbing an unhealthy snack, drink a green smoothie and you’ll get an instant energy boost. Make sure that when you blend regularly to mix up the ingredients. Vegetables all have their own specific set of nutrients and to enjoy them all, you’ll have to blend different types of vegetables. A good tip is to keep the rainbow in mind when you go grocery shopping. Find vegetables of different colors and you’ll get the most of your green smoothies. Read more about why drinking green smoothies regularly is good for you. What Type of Blender Should You Get? If you’re into blending as much as I am, or if you’re keen to get started with green smoothies, I strongly recommend Blendtec and Vitamix blenders. They are a pit pricier than the average blender you can find in every department store, but they give you the best results and they last very long. The point of blending is to extract the nutrients from vegetables and fruits, and Vitamix and Blendtec blenders do this perfectly with their powerful motors. Have a look at the Blendtec blender range (new and refurbished) on Amazon, or check out the best deals on Vitamix blenders. Amazon also sells refurbished Vitamix blenders that are a bit cheaper than brand new ones but are still very good quality. I have been a happy owner of a Vitamix 5200 Total Nutrition Center for more than 4 years now and I can honestly say that it has changed my life for the better. On average, I make around 2 liters worth of green goodness each week with my Vitamix. My blender makes it so incredibly easy for me to consume many different types of vegetables (mostly raw), combined with a healthy dose of fresh fruit. This allows me to take in a great variety of nutrients on a regular basis, which has a great positive impact on my overall health and well-being. And it’s not just green smoothies that you can prepare, your Vitamix blender can also make the best soups, such as pumpkin soup. If you’re thinking to buy a blender, please visit my recommendations for affordable blenders that can prepare great smoothies for you. Is your budget a bit higher? Check out my favorite high-end blenders that can literally blend all foods. If you’re more into juicing, check out my juicer buying guide for the best juicers across different price ranges. Over the years I have created many different types of green smoothies. I’ve been documenting the best green smoothie recipes so I can share them here on Healthy Food Tribe for you to try at home. All of these recipes are very easy to prepare and, above all, super nutritious. Blending vegetables and fruits is the perfect way to get your vital nutrients in and improve your overall health. I have been making and drinking green smoothies consistently for many years now and I can honestly say that this lifestyle change has had a massive impact on my health and well-being. Are you looking to invest in a new quality blender but not sure which one to choose? 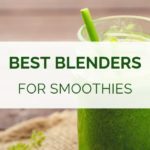 Read on as I share with you my recommendations for best blenders for green smoothies, based on price/value, durability, performance and ease-of-use. The fun part of having a quality blender in your kitchen is the experimenting with different fruits and vegetables that you would otherwise not eat or buy. Over the years, I have created many green smoothie recipes, some worked really well, while others turned out to be a complete fail! But that’s really the fun of having a blender. Just keep experimenting with recipes and ingredients and see what works best for you. 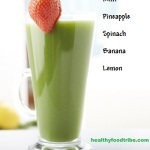 It was only recently that I tried adding green tea to my smoothies as I was looking for new ideas for recipes. This parsley and cucumber detox green smoothie with extra ginger and lemon is a powerful way to detox and to feel recharged and revitalized within moments. Packed with nutrients this detox green smoothie will reduce inflammation and will detoxify and re-hydrate your body. Not only is this a great way to improve your alkaline-acid balance, this smoothie also fits well in any weight loss program. With a mix of fresh fruit and thick Greek yogurt, this sunrise green smoothie will be the best way to start your day. You certainly won’t need a coffee to wake you up in the morning after drinking this delicious and nutritious smoothie! The color may not be green, but this easy and nutritious banana berry smoothie will definitely give you an instant health and energy boost. 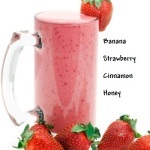 Fresh fruit combined with yogurt, cinnamon and honey creates a delicious smoothie! If you’re in need of a healthy energy boost in the morning to get you going for the rest of the day, then try this delicious carrot and spinach green smoothie with apple and ginger. This powerhouse drink is high in vitamins A and C and is loaded with a great variety of minerals such as potassium, calcium, folate and magnesium. Mint may not be the most common ingredient for green smoothies, but its health benefits are indisputable. Mint is very rich in antioxidants, is good for the stomach, helps against nausea and headaches, and also promotes healthy skin. Mint has a very unique taste and distinct smell, so it is important to mix mint with the right ingredients to make your green smoothie taste great. This is a simple mint green smoothie that you can use to start experimenting with mint in your smoothies. Spinach and kale are very popular ingredients for green smoothies because of their strong nutritional benefits but also because of their good taste. When you combine these two together and mix it up with fresh fruit, chances are you will end up with a great looking and very nutritious green smoothie. To make it even more nutritious, add a bit of avocado to get that delicious creamy texture.